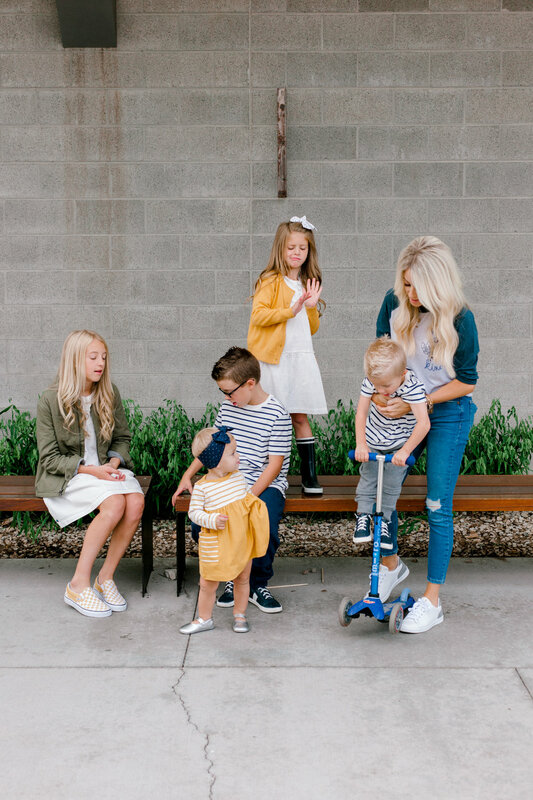 Back to School Traditions with Kailee Wright — THE HANNA BLOG Worked like a charm! This post was written by the wonderful Kailee Wright! Summer is quickly coming to an end. As crazy as it can get, I'm going to be so sad when my big people head back to school. It has been so nice to have them all around! We are soaking up every minute of this family time we can get! With Back to School season upon us, my mind is starting to think all things Back to School Traditions! I love trying to come up with a few simple things that will make this time of year extra special for my people, and remind them how much we love them! Since I know we are all trying to make our little ones special through easy fun memories, I thought I'd share some of our favorite Back to School Traditions with you today! When it comes to Back to School shopping, I have found it is a lot easier if I try and tackle most of it myself. I can find pieces that are timeless, transitional, and versatile without too many distractions. I love to grab great basics that can work throughout the year. A perfect example is a dress like this white one. I love how timeless it is and that it can be paired with a cardigan in cooler weather, and totally transformed with a pair of shoes. Same with a good pair of joggers and a tee for the boys. So transitional and perfect for all year long. While I tend to do the shopping myself, one of our very favorite Back to School Traditions is our one on one shopping dates. Each of the little people get to plan a date, just the two of us. They pick where we go to lunch and then we head shopping. They get to pick out one outfit they love that is totally their personality. Of course we finish the date with a treat too! It has been so special to just have that time to talk with them while eating our trying on clothes. They feel more open to talk about all the excitement they have for the upcoming school year and even worries too. It is something I really look forward to all year, and I know they do too! This one might not qualify as a Back to School tradition quite yet. We are starting it this year and I'm excited to see my peoples reaction. A few of my girlfriends told me about it and I loved the idea. I love that you can make it as big or as simple as you want. You are basically just taking your dinner the night before school starts and a little flare. If you want to decorate, Target has some adorable school supply banners + die cuts for simple decorations. I plan to tie some balloons to their chairs to add some more fun. One friend just put their new backpacks on the back of their chairs with little name strips at each plate. So easy with things you already have but it means so much to them. You can make their favorite meal, or even get takeout from their favorite place. I love how simple it is but will be such a fun memory and something for them to look forward to. If you follow along on Instagram, I asked readers to submit some of their favorite Back to School traditions too, so I could compile a list. We got so many fun responses, I can't wait to implement a few with my people too! · Plan one last "Summer Hurrah"! Our Summer Hurrahthat is 100% a kids day from Breakfast to bedtime! Everything we do is all up to them. We try to include fun stuff like a donut run in pj's for breakfast, a movie night in the backyard with popcorn and treats, a "city tour" hitting up all their favorite parks and treat stops...it can be so simple, but them being in charge makes them LOVE it! · Back to School Breakfast! I go all out and decorate with school supplies and balloons and get or make something unexpected for breakfast like donuts or crazy colored pancakes! · Make up a Family Motto for the coming school year. We love doing this because it gives us something positive to focus on throughout the year and reinforce with out kids. Something like "Be Brave" or "Speak Up" to remind them how special and important they are in the big real world too. · Back to School Interviews! Every year the night before school starts we "interview" our kids. The questions are all focused around them and their current favorites. It is so fun to look back and see what things change each year and what stays the same. · Make a School Year Bucket List! We tend to focus on fun Summer Bucket Lists, but school can be super fun too! We put things like "Read 25 new books"..."Visit the Library"..."Go to a Museum". They are still fun things that get them excited, but more education focused. · Boo-Hoo Mom Breakfast! This one is a little more for the moms. A friend of mine always hosts what she calls a "Boo-Hoo Breakfast". All the moms meet up for breakfast once we've dropped our kids off and cry (happy and sad tears) over breakfast together. · Write a Sidewalk Chalk Good Luck! I love surprising my kids as they head to the bus stop with a sidewalk chalk good luck! My husband and I decorate the driveway and sidewalk with Good Luck Messages and Back to School pictures for that last little boost of love on their way to the first day. · Back to School Fashion Show! This was always my favorite growing up, so I had to continue it with my own kids! After our Back to School Dinner, we host a fashion show where the kids get to show off their favorite new outfits to us and grandparents. We have music and lights, to make it more fun. · First Day of School Fairy! My kids are greeted by gifts from the First Day of School Fairy with their breakfast. It is just simple school supplies like a new notebook in their favorite color and some fun pens, along with their favorite treat. · Water Bomb The Bus! Every yea all the moms in our neighborhood host a first day of school party after school. It starts with us "water bombing" the bus with water balloons and welcome home signs as they pull in to the neighborhood. A little cheesy but so fun to remind them we still miss them and are excited for them. · Back to School Bracelets! This is something new we are starting this year with my oldest going to Kindergarten. You find something like a bracelet (you could find something else for a boy) that is matching with your child. You both where them, and tell you child if they miss you to just look at the bracelet and remember how much you love them. I'm getting teary just thinking about it! · Back to School Service! One of my all time favorite traditions is our service night. My siblings and I load up all our kids and hit up the Back to School sales. We let the kids fill the carts with supplies to fill backpacks for kids in need. It has been such a special thing to do as a family each year, and a great way to teach your kids to give back. · Back to School T-Shirt! I buy each of my kids a Adult sized t-shirt when the start Kindergarten and write "Class of ___" across the front with a Sharpie. Every year on the first day of school, I take their picture in the same t-shirt to show how much they have grown. I have a son that is a Senior in High School this year that can just barely squeeze into it now. One of my favorite traditions! · Ice Cream Date! Every year on the First Day of School, I take all my kids out for ice cream to the same place and listen to their favorite things about the day. While it is hard to see summer end, we are so excited for what the new school year hss in store for us! What are you most excited about? !